Looking for that perfect beachfront vacation rental? 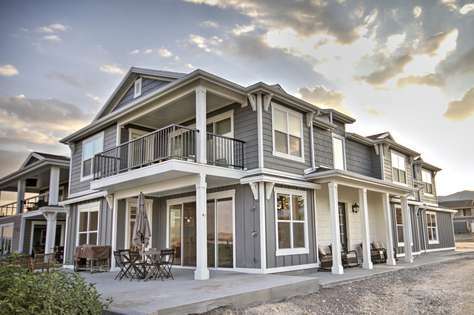 You've found it here at Legacy Beach at Bear Lake, We're a one-of-a-kind private beachfront living community with endless opportunity for families in a prestigious mountain and lake resort town. 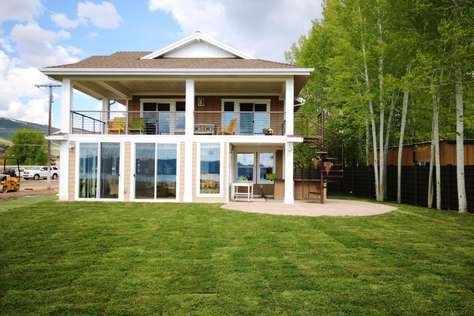 Vacation Rental Homes at Legacy Beach Resort on Bear Lake. The Sands at Legacy Beach is a luxury lakefront home located at the Legacy Beach Resort. This 5 bedroom 4 bathroom home has everything you and your family are looking for in a vacation rental. Waking up only feet from the beautiful waters of Bear Lake is hard to beat and that is how you will start every morning of your stay at Legacy Beach. The Sands at Legacy Beach will sleep up to 24 people comfortably and has two spacious living rooms for your enjoyment. If you enjoy cooking you will love this kitchen with its stainless steel appliances and granite countertops. One of the best features of the Sands at Legacy Beach home is the great room on the main floor that turns into a beautiful sunroom as it's surrounded by slidding glass doors that create an indoor-outdoor type of living. The covered deck on the second floor offers you picturesque views of the lake that you will be telling all your friends about. As a guest at the Legacy Beach Resort you have access to all the amenities at the resort. The Legacy Beach Clubhouse features two change rooms and a gym featuring the newest Freemotion excerice equipment. The Legacy Beach Pool & Hot tub are located at the clubhouse and offer stunning views of the Lake as they sit overlooking the lake. As a full service resort the Legacy Beach staff will lauch your boat, jetskis or any other water vehicles you may have brough with you. This home is only available for rentals from July 1st - July 15th. The Retreat is one of 5 lake front homes available for rent at Legacy Beach Resort and offers some of the best views on the entire lake. The home features two amazing living spaces to spend quality time with your friends, family and guests, playing games, dinning or enjoying talks around the firplace. Enjoy cooking in a perfectly layed out kitchen where you can enjoy the views of the water as you prepare your meals and entertain your guests. The main floor of the home features the kitchen & dinning area along with a spacious living area and is where you will find the masterbedroom with a king bed and private bathroom. As you head upstairs you will notice the large open living space with a big screen TV and a giant couch that's perfect for movie nights. 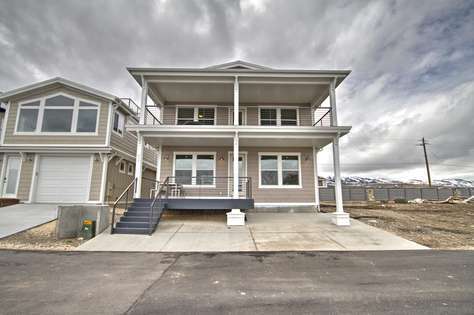 The other three bedrooms and two full bathrooms of the home are located upstairs as well. The bedrooms are arranged to accomodate families or those willing to share rooms with a king bed and a set of bunk beds in each of the first two bedrooms. The other bedroom is where you find the remaing four queen beds in a room we like to call the party room. Kids and couples alike will enjoy sharing bedtimes stories from the day and what the next day will bring. The retreat is a perfect home for groups of 18 - 22 that are looking for a quite, peacefull, & relaxing place to spend their vacation. The house sits about 200 yards from the Legacy Beach Clubhouse that features, a gym, swimming pool and a hot tub that is open year round. Legacy Beach also offers a boat valet when to stay here, which means you never have to visit the state marina again. If you need lots of space for a large group but value privacy, the Inn at the Lake is the place for you. This 17-bedroom, 19-bathroom property is laid out like your own personal hotel. It features a newly remodeled kitchen that is perfectly suited to cooking for crowds, a group dining area, a sprawling wrap-around porch, a private pool, playground, hot tub, and countless other features that will make your group vacation a huge success. Enjoy a movie or the satellite TV in the theater room or enjoy a little quiet time in your private room and bathroom. When you and your guests are not enjoying the countless amenities that the Inn at the Lake offers, take a short stroll to town to treat yourselves to Garden City’s gift shops and restaurants. Book the Inn at the Lake today to enjoy a group location that can’t be beat! Escape the city and come visit the Hideout at Legacy Beach were you can relax and hide from the big city lights! The Hideout combines two of the townhomes at Legacy Beach to create a unique space to be enjoyed by our guests. Within the hideout you will find 2 levels of living. On the bottom level you will find a large bunk room for the kids with a spacious living area and one large bathroom. There is a loft area above that bedroom that provides a wonderful play area for the kids. Upstairs you will find the kitchen that offer views of the beautiful Bear Lake water. On the second floor you will find the Master bedroom with the ensuite bathroom. The other two bedrooms and bathroom are also located on this level which also boast a large dinning area. - Boat & Jet ski Valet. - Legacy Beach Staff will launch and pick up your watercraft during your stay. Guests must call 435-494-1663 to schedule launch and pick up time. Tipping the staff is recommended. - Access to the Beach's of Bear Lake. Located in the Legacy Beach Resort just a few short steps away from the beautiful Bear Lake water sits this 6 bedroom 5 bathroom home. Within the Legacy Beach Resort this home sits directly to the east of the clubhouse and swimming pool so all you have to do is open the sliding glass doors to the patio and 25 steps later you will be enjoying the warm waters of the hot tub, overlooking the lake. 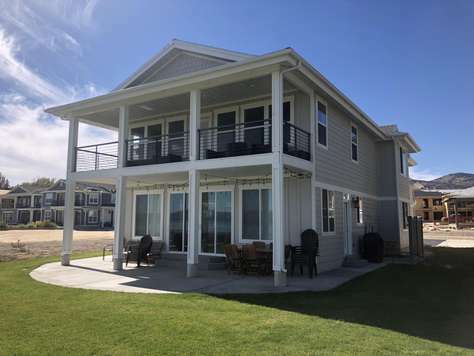 It's also great to be able to sit on your deck overlooking the common grass area and be able to everything that is going on inside the resort and on the water of Bear Lake. One of the many wonderful features of this home are the two large Master Suites with king beds and your own private master bathrooms. The kitchen is located on the main floor and is combined with the great room to offer a very spacious living area to enjoy each other company during your stay with us. We created this floor plan with our guests in mind. Large open spaces for gatherings on both levels with a spacious great room on the main level and a beautiful loft overlooking the lake. 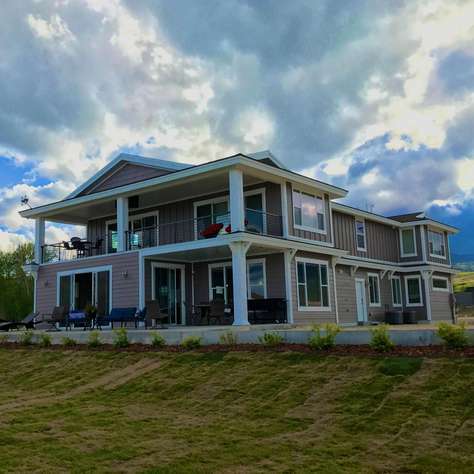 The large wrap around deck gives you the perfect place to enjoy the sunrises and sunsets overlooking the waters of Bear Lake. The bedrooms are on two levels. On the main level you will find one of the master suites and another large room with two queen beds. Upstairs is were the majority of our guest will spend their time sleeping. With four bedrooms that includes one bunk room you will be able to sleep 20 on the upper level. Legacy Beach resort offers a 24 hour gym that is just outside the door of this home. Other amenities at Legacy Beach include a hot tub, swimming pool and access to the waters of Bear Lake. Legacy is one of the only resorts in Bear Lake that has their own private boat valet service, which includes them launching your boat and retrieving you at the end of the day. If you are looking for the best resort experience in Bear Lake Legacy Beach is the choice for you! Looking for an affordable townhome rental at a Luxury resort? The Lakeview townhome at Legacy Beach Resort is exactly what you need. Enjoy a view of the lake from your second level balcony and located just a short walk from the Legacy Beach clubhouse which includes a swimming pool, year round hot tub and a 24 hr gym. Featuring 4 bedrooms on 2 levels of living this townhome is perfect for small groups to large groups of 12. The Cayman at Legacy Beach Resort is a breathtaking 6 bedroom 5.5 bathroom home that sits only feet away from the shore of Bear Lake. Enjoy the morning sunrise from your private patio facing the beautiful waters of Bear Lake and continue the day enjoying the Legacy Beach amenities which include a gym, swimming pool, hot tub, and a boat launching valet. The Cayman has a wonderful floor plan designed with vacationers in mind. The main floor of the home is where you will find the spacious open living room and kitchen which was designed for large gatherings and entertaining our guests. There is one bedroom and 1.5 bathrooms located on the main level. There is a master suite with a king bed and a private bathroom. The upstairs of The Cayman has 3 bedrooms. This is where you'll enjoy talks on the deck overlooking the lake or just relaxing on the comfortable couches. One room has a king bed with a private bath and lake views and 2 other premium rooms both with a queen bed and a twin bed. Downstairs is where your nights will be spent enjoying movies and playing games. There is a great room and 2 bedrooms. 1 room has 3 bunk beds where you can jam all the kids and the second room has 2 queens. Looking for an affordable townhome rental at a Luxury resort? The Lakeview townhome at Legacy Beach Resort is exactly what you need. Enjoy a view of the lake from your second level balcony and located just a short walk from the Legacy Beach clubhouse which includes a swimming pool, year-round hot tub and a 24 hr gym. Featuring 3 bedrooms on 2 levels of living this townhome is perfect for small groups to large groups of 12. Legacy Beach is located in the perfect year round location. One of Utah’s best kept secret is Beaver Mountain ski resort just a short 18 minutes from your front door you can be on the lift of one the last true family owned ski resorts in the country. Legacy Beach is right next door to endless miles of hiking trails, four wheeling trails and unlimited snowmobiling trails. Legacy Beach is also a jumping off point for camping, fly fishing, snowshoeing, back country skiing, rafting, kayaking and just about any other outdoor or mountain recreation activity you can experience in the Utah’s wilderness. Welcome to Legacy Beach, Bear Lakes finest full service resort. Choose the perfect home listed above and Book your dream vacation!